iBerry Auxus Linea L1 is priced at RS 6990 and comes with some nice specifications. The Auxus Linea L1 will compete VS with Micromax Unite 2 A106, Xolo Q600s, Karbonn Titanium S2 Plus, Motorola Moto E and Lava Iris X1. The Iberry Linea L 1 comes with 1.3GHz MT6582 quad core CPU and 1GB of RAM. It runs on Android 4.4 Kit-Kat OS and has 4 gigs of internal storage. It will be launched within few days and you will be able to buy it Exclusively from ebay.in . 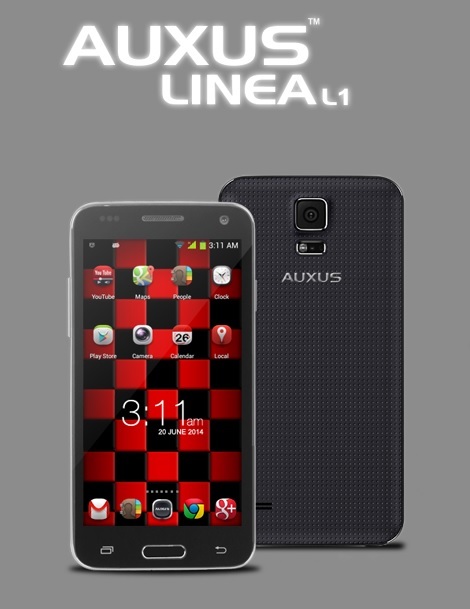 The Auxus Linea L-1 has 4.5 inch display of 854 x 480 pixels resolution and corning gorilla glass protection + lamination. You can expand the memory of the phone up to 64GB via micro SD card slot. The L1 packs with 5-megapixel primary shooter with flash and 2MP front camera. It has 3G , WiFi, Bluetooth, GPS and FM radio connectivity ( no info on USB OTG ). It draws the power from 2000 mAh battery. For smooth game play there is Mali 400 MP gpu. It features light, proximity and accelerometer sensor. Along with the new Linea L1 company has also launched the Auxus AXO4 / Ax-04 tablet for INR 5,990. I booked this phone from ebay. I am using this phone but I am dis pointed by using this phone. It's 100% waste of money.